The crappie are biting on Slab Buster Crappie jigs. Slab Buster offers 2 inch and 2.5 inch crappie jigs in many different colors. Stock your tackle box now with your favorite Slab Buster Jig colors and get ready to catch crappie this season! Word continues to spread across the country about one of the hottest crappie lures in the Midwest. Developed by "Slab Buster Jack" Stevens at Missouri's Lake of the Ozarks, this crappie jig is now becoming popular among many fisherman on other lakes throughout the country. This scented plastic crappie jig is becoming the go-to lure for many experienced slab seekers. Pick up some of these crappie jigs and get ready for some great fishing. Check out the Products page for the most recent color and size additions and download the Slab Buster Jig Color Flyer. Ask Jackson about his ""Red Devil" crappie jig, a great new dynamite combination of red and silver. These new lures are combinations every crappie fisherman should try. Recent results show that the new black and electric silver along with the blue and silver jigs are particularly effective catching winter crappie in deep water around docks and brush. 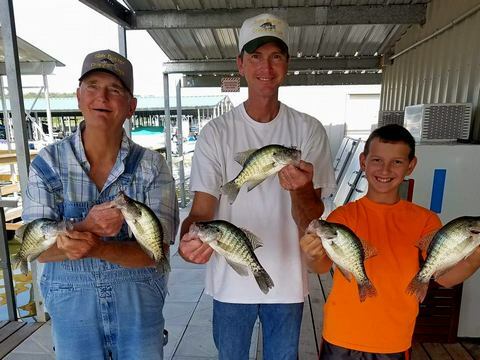 Crappie fishing is very popular in many of America's lakes, rivers and ponds. Crappie fisherman are often looking for a lure that will produce great results under a variety of conditions. Slab Buster Crappie Jigs now comes in over 30 color combinations to meet that variety of fishing conditions. You are bound to find a combination that will work in your lake, under any water or lighting condition. Each 2 inch plastic jig has a solid cylindrical body and a thin, active tail section. Crappie are attracted to the jig's action, and they just love the scent. You will catch fish whether you swim these crappie jigs slow, fast, or hold them still. Crappie fishermen take note! Two of the popular jig colors include the Red Flake/Chartreuse Silver known as the “Red Devil” and the Black/Chartreuse Silver. Slab Buster Crappie Jigs are sold at many reputable bait, tackle and fishing shops. For more information on where to find Slab Buster Jigs go to our Where to Buy Slab Busters page. New retailers are being added weekly to the list of Slab Buster Crappie Jig distributors. If your favorite local shop does not carry Slab Buster Crappie Jigs, ask them to contact Jackson at 660-527-3864 to become a distributor. Slab Buster Crappie Jigs is a family owned business. Pictured are Jack, Jackson, and Parker. For more photos visit our Fishermen Photo link.